Should a Firewall be for life? It’s not just a wall, it’s a firewall and for such crucial protection, the use of composite panels gives buildings a huge performance boost. But, Brett Harrington, Divisional Manager for the Firewall and Data Division of ISD Solutions, warns you will get what you pay for – as we’ve learned firewalls must never become mere commodities for sacrifice on the altar of cost. Fire is the disaster that does not discriminate. No matter what or where your company is, fire can destroy it. The importance of fire safety from composite firewalls should therefore never be understated. The trend to use composite panel walls for applications including firewalls in modern warehouse construction is on the increase because of the multiple advantages they offer. In fact, their use across the warehouse sector is fast replacing traditional stud and block products in everything from warehouses and offices to cold stores and distribution centres. They are lightweight, tremendously durable and have improved thermal properties. Furthermore, build times are reduced, construction costs are lower and maintenance is easier. Compared to blockwork its carbon footprint is lower too. And with demand growing for ever-more cost-effective warehousing and all kinds of other storage at home and abroad, we have never been busier. But with opportunities come responsibilities – major ones. Firewalls must never be seen to be a mere commodity open to corner cutting on costs or time. They must use the most innovative fire-protection products, recognised by fire authorities and insurance companies. ISD Firewall, for example, is built around the latest steel-faced composite panels with non-combustible mineral fibre cores to offer complete protection for premises and their contents. These are an evolutionary replacement for jumbo stud or block walling that are faster to install, more aesthetically pleasing and completely demountable for re-use or re-positioning. The best-designed firewall packages cover all aspects of junctions and penetrations, sealed using approved materials, which fully meet all clients’ fire protection requirements. The result is clean and smooth, stylish and safe. Furthermore, they are convenient and boast another key advantage: composite panels are a finished product. Traditional wall types, on the other hand, require ‘follow-on’ or ‘wet trades’ to plaster and paint the wall after installation. This in turn often requires scaffolding, which slows down the installation further. Composite panels, therefore, lead to significant savings in construction programmes and costs. The benefits stack up and are demonstrable: ISD Solutions is seeing upfront savings in build costs of up to 20% when compared to a traditional facility and a reported 30% increase in long-term energy efficiency when compared to traditionally clad building projects for a range of commercial and industrial structures. The facts speak for themselves in exemplary installations such as Hydraforce. The leading manufacturer of hydraulic valves and controls wanted to expand its manufacturing facility by 7,000 square metres to allow it to bring more manufacturing over to the UK from its parent company in America. A major part of the construction project included a 30-minute fire-rated divisional wall to separate office and canteen areas from the warehouse. A series of non-fire rated walls and ceilings meanwhile formed a goods-in-and-out area and quality lab. The project was delivered to the required spec in just six weeks. Fire-rated viewing windows were installed within the office and canteen areas – all seamlessly integrated within the composite panels installed. It looks as well as it functions. All this was achievable because the most innovative fire-protection products were used to meet the requirements of independent certification bodies such as Loss Prevention Certification Board (LPCB). But design and installation are no less important than products and materials. Why should people choose expensive advanced reliable walling systems? Primarily to protect life and property. By choosing products that are third-party accredited, the designer or architect is able to mitigate those risks and show due diligence has been met. The primacy of protecting life and property means firewalls need to be taken seriously. Products not appropriately third-party tested could contribute to a fire rather than stop its progress. An inferno in 1993 at a food processing factory in Hereford resulted in two firefighters losing their lives after being trapped by a collapsed ceiling. The nature of construction does not always help. In many areas of the sector, contractors are in a fiercely competitive market and increasingly looking to cut costs in any way possible. There will always be a temptation to use a cheaper “equivalent” product rather than an approved or specified one to gain the edge in winning work. But is that so-called equivalent the best product available to ensure the fire does not spread? Rarely is the best product the most cost-effective and therefore the construction industry risks building with average products and unskilled labour to reduce costs. As with most things, you get what you pay for, and using accredited products and installers minimises risks. Nowhere is the benefit of using the best products and installers more evident than in design details: the best-designed firewall packages cover all aspects of junctions and penetrations. A partition may have multiple types of penetration such as services, steel frames, pedestrian or industrial doors and windows, but each component is integral to create the fire barrier. Such intricate design details were the focus of Urbaser Balfour Beatty (UBB), which wanted firewalls and compartmentation for a massive new Mechanical and Biological Treatment (MBT) facility for Essex Waste Partnership in Basildon. One of Europe’s biggest waste treatments, it processes up to 417,000 tonnes of municipal waste from across the county. Containment and separation for the various treatment stages within the facility were critical to ensure safety, minimise fire risk and confine corrosive processing environments. ISD Solutions installed 8,500 square metres of specialist composite steel-faced panels within the concrete and steel structure to form airtight fire separation between key processing areas. The solution met stringent design parameters and used HPS200 coated panels and a unique Ceramicoat coating on the Firebatt which sealed the firewalls. The resulting high-spec ‘marine quality’ solution is able to withstand volatile and corrosive conditions, minimise fire risk and help to limit insurance requirements for the facility. Projects of this scale and complexity set unique challenges. Dealing with the potentially corrosive environment needed a very high-spec solution and meticulous installation. But by selecting third-party-tested products and using accredited installers clients know they are selecting the best the market can offer. An experienced design team, covered with extensive PI insurance selects and installs the best solution for each scenario. Some companies use a sub-contracted designer rather than an employed design team which can raise quality issues. Other companies provide no design for their panel installation at all. This is risky as main contractors may then have the design liability and therefore risk passed onto them. Architects are also in a competitive market so the detail work they carry out is frequently undertaken by experienced subcontractors that can add value. 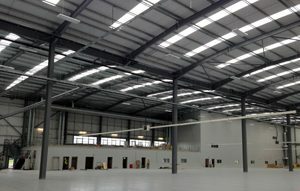 Back in Hydraforce’s centre, the range of composite panel technology incorporated makes the building truly state-of-art. The structure is shiny, new, super functional and pleasing on the eye. But more importantly, it has created a totally secure working area that not only future-proofs Hydraforce’s manufacturing centre from the risk of fire. It also gives peace of mind to the staff inside their super-protective cocoon of composite panel construction that is both environmentally friendly and economical to run.